HANDS-ON APPROACH: Chris Waterson, left, general manager of Waterson Terminal Services at the Port of Providence, speaks with Gabriel Spych, services supervisor. In the background is the Nikos N, out of Chennai, India, carrying hand-cut cobblestones from India. Waterson said every WTS customer receives hands-on management on a day-to-day basis. 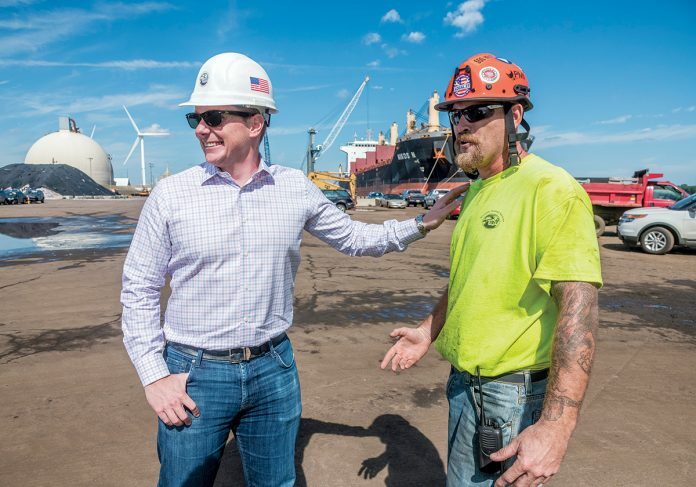 Waterson Terminal Services LLC formed less than a decade ago, a new company that combined the business interests of two previous founders and worked together to manage the Port of Providence. Over the past decade, its footprint and package of services have grown through adaptation. General Manager Chris Waterson, who followed his father into the business after he graduated from Bentley University, remembers when coal shipments were the most common arrival into the port. “At that time, coal was king for us,” he said. Now, the company is positioning itself to thrive in multiple locations, by managing the shipment of offshore wind components. The reduction in coal offloading started by the mid- to late-2000s, when natural gas surpassed it in New England. In recent years, the port has become more ingrained in the wind-energy business. Waterson Terminal Services, which manages the port operations and hires the longshoremen, recently expanded from its original ProvPort location into two additional ports to cement that niche. Still run by its founders, Bruce Waterson, the chief operating officer, and Ray Meador, the chief financial officer, the company has a total of 57 employees, including 17 in administration and about 40 full-time-equivalent positions who are unionized longshoremen. The company now provides stevedoring services for Marine Commerce Terminal in New Bedford, and at the Port of Davisville at Quonset Business Park. Its work in both parks is focused on the arrival and shipment of renewable-energy materials, such as wind turbines. The decision to move beyond its original footprint in Providence is a strategic one. The opportunity of the emerging wind-energy industry prompted the company to look for expansion opportunities. Once the wind industry really gears up in New England waters, multiple ports are expected to be needed to process and ship components for the massive towers. Waterson is thinking of that in the near-future. One of the ways the company has been able to secure additional work, and shipments into ProvPort, is by remaining nimble, he said. In the world of ports, ProvPort is small, and the management company is run in such a way that all customers who move goods through the facility have Waterson’s cell phone. If they need to talk to him, they’ll get him.